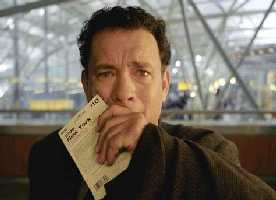 Cast: Tom Hanks, Catherine Zeta-Jones, Stanley Tucci. Story: A man is stranded for months in an airport when his country collapses politically during his flight. The Terminal is a fairy tale pure and simple. Tom Hanks is Buttons and Catherine Zeta-Jones is Cinderella, albeit with a bigger bank balance and with a contemporary coating. Only attempt to watch it if you have a sweet tooth - well, a mouth full of them really. The Terminal is the story of Viktor Navorski (Tom Hanks), an eastern European immigrant who is stranded at New York's JFK airport when his native country "Krakozhia" collapses from a military coup during his flight. Viktor's a darned nice bloke but doesn't speak more than a few words of English and so resolving his situation becomes a little tricky. His situation isn't helped by dozy-arse airport staff who insist on explaining his situation to him in English when he clearly doesn't understand a word of it. This situation is quickly resolved though, as Viktor buys two copies of a New York travel guide - one in English and one in Krakozhian - and learns the language by comparing the two texts. Including the pronunciation. Oh dear oh dear oh dear. Show me someone who buys that and I'll show you someone too young to control their bowel movements. This is the big stumbling block in The Terminal - the plot details are so stupid that they get in the way as much as Bernard Manning stuck in a water-slide. If you have the slightest desire to poke holes in The Terminal then you will spend the entire two hours with your index finger doing piston movements. It's as thin as Kate Moss's anorexic cousin. It doesn't take long to turn the brain off though, and after you do it improves no end. Tom Hanks isn't completely convincing as a non-English speaker - his accent is inconsistent and he understands far too much of the nuances and mannerisms of the western world - but he's good enough to pull off the part and brings much of his trademark charisma. Catherine Zeta-Jones shows up from time to time as a lovelorn air stewardess and from here on it's Spielberg by numbers. There are no surprises, no excitement, just the story and a few mildly amusing incidents. Spielberg tugs at the heart-strings as only Spielberg knows how, though this time he has over-glucosed the porridge a tad. This is a movie for the ladies, it's a light romantic comedy, as predictable as Neighbours, but without the mahogany acting. 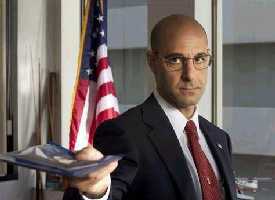 Stanley Tucci is great as the slightly malevolent airport boss guy and there is a host of supporting characters to add variety and amusement. The airport itself does feel like an airport - much of the movie must have been filmed at the real JFK airport - and against all the odds we do end up rooting for unlikely hero Viktor, because there's a bit of all of us in him and world-weary Amelia (Zeta-Jones). Much maligned as The Terminal has been, it's really not that bad. It's soppy enough to engage the romantics and smooth enough to catch a few floaters too. If you think you'll like it or if you think you'll hate it, you're probably right. If you're wavering, give it a shot. At worst, you'll get a sugar fix. Testosterone Satisfaction Rating: 0/5 Blokes don't do saccharin. To enjoy this film you should: enjoy sugary-sweet fairy tales.